575 hp BMW M5 Nighthawk Special Edition too hot for the U.S.
BMW has revealed an ultra-exclusive M5 Nighthawk Special Edition that will only be sold in Japan and with a very limited number. BMW has revealed a very exclusive 2013 M5 Nighthawk Special Edition that is too outrageous for the rest of the world. Autoevolution is reporting that only 10 ultra-exclusive examples will be sold and all of those will go to Japan. We are wondering why Japan is the only country that gets this limited edition M5 Nighthawk. The rest of the world will be able just look and not touch this black beauty. We have just enough details to wet our appetites and this special M5 is absolutely outrageous. BMW has taken the high-performance M5 and turned it up a notch. The standard model gets a twin-power turbocharged 4.4-liter V8 pumping out 560 horsepower and 500 lb ft of torque. The M5 Nighthawk Special Edition gets the M5 Competition Package which adds another 15 hp added to the already potent powerplant for an extra adrenaline kick. BMW will only produce 10 ultra-exclusive limited edition models that will make their way to the Japan market. BMW will put a price tag of 18.2 million Yen which converts to $181,981 USD. That’s more than double the $90,200 sticker price for the 2013 BMW M5 sedan. Maybe they already have buyers lined up to pay the exorbitant price tag in Japan. The new M5 Nighthawk Special Edition will not only get enhanced engine output, but it will get the Competition Package with more direct steering and a specially designed performance chassis. The additional 15 hp power comes from boosting the pressure in the upper range of revs. It also features a modified exhaust system, and a specially designed suspension, which has been lowered by 10 millimeters. Outside, the BMW M5 Nighthawk comes in one color, Individual Frozen Black. It features exclusive 20” M Double-spoke 601 M light Black alloy wheels and mixed tires together with the twin tailpipes of the Sport exhaust unit in black finish. To finish out the exclusive look, BMW added dark chrome front kidney grilles, side gills, door handles, side mirrors, rear diffuser and adaptive LED headlights. Inside, the M5 Nighthawk comes with a Merino two-tone leather interior in a Sakiru orange shade and the company's M Performance carbon interior trim. Each limited edition model will come with an individually numbered badge to show the exclusivity. The twin-turbo V8 will come mated to a seven-speed M-DCT automatic gearbox. It also features a performance clutch assembly, M Dynamic Mode, carbon-ceramic brakes, and a lane departure warning system to finish out the package. The new special edition M5 will launch from 0-100 km/h (62 mph) in 4.2 seconds. BMW will offer a lottery system for the very exclusive 2013 M5 Nighthawk Special Edition if Japanese demand is more than the 10 models being built. The rest of the world will just have to look and not touch the new ultra-exclusive BMW M5. 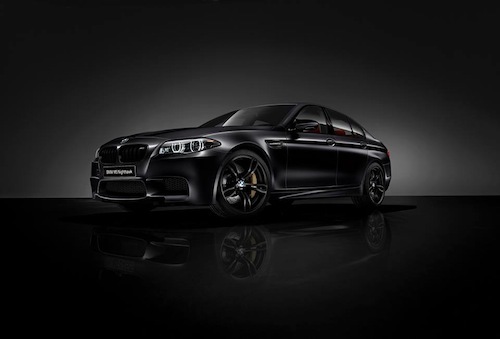 Watch BMW M5 Nighthawk Special Edition video from germanmedeot.